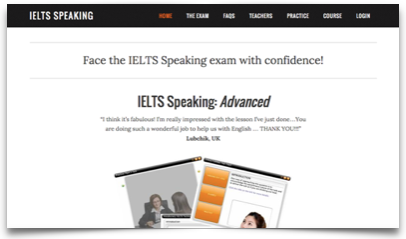 The go-to website for students wishing to prepare for the IELTS Speaking exam. Many thousands of candidates worldwide sit the IELTS exam, which is often required for visa and university applications. In 2012, Splendid Learning launched the IELTS Speaking website to cater for the demand for Speaking practice materials. These resources include vocabulary lessons, video tutorials, podcasts and the chance to try online IELTS-style Speaking tests. There is also the opportunity to join a free email course ‘Roadmap to IELTS Speaking Success’. Teachers can sign up for free weekly photocopiable lessons to use in conjunction with the website as a blended learning resource. The website is becoming ever more popular with a 40-50% increase in visitor numbers each year. During busy periods the website attracts nearly 55,000 users a month who generate over 90,000 sessions and nearly 250,000 page views. The website also has a supporting Facebook Page with a following of 43,000 students and teachers. This is a wonderful site and concept to help people improve communication and confidence. I was pleasantly surprised by the excellent contents of the material which is really very useful for anyone preparing IELTS. Great job!!! A really helping hand for those who don’t have an opportunity to be checked at home. Following the steps and instructions can motivate a student and achieving success in only the matter of time.